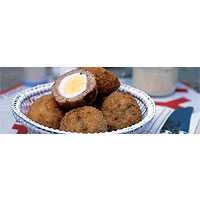 Homemade scotch eggs are gorgeous, and I can't think of many portable foods better than these. Use the best organic free-range eggs and the finest sausagemeat and you can't go wrong. The water added to some meat can evaporate during cooking - so if you've used the best, the eggs won't rattle around inside the sausagemeat. Rinse the eggs to get rid of any stray shell, then dry assiduously. Work the parsley and a good measure of pepper into the sausagemeat, then divide the mixture into 12 portions. Take two portions and flatten them out. Roll an egg in flour, then clamp gently between two portions of sausagemeat. Mould the meat all round the egg, making sure that the two halves meet and are sealed together evenly, with no holes. Repeat with the remaining hard-boiled eggs and sausagemeat. Arrange your production line by the stove: furthest away a plate with the sausagemeat-wrapped eggs on it, then a shallow plate with seasoned flour in it. Next, a shallow bowl with the beaten egg and right by the hob, a plate of breadcrumbs. Heat a good 4cm depth of oil in a saucepan until it's hot enough to brown a cube of bread in 1 minute (but no hotter – the sausagemeat has to cook through without burning). Now roll your eggs one by one in the flour, then dip in egg and finally coat evenly in breadcrumbs. Fry 3 in the hot oil for about 8–10 minutes until they’re golden brown all over. Drain them briefly on kitchen paper, leave to cool, then repeat with the other 3 eggs. A glass of lightly chilled Beaujolais cuts through the richness of the meat but has enough fruit for the flavour-sapping egg within.